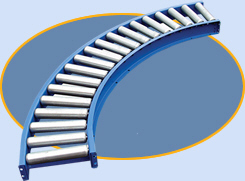 Medium and Heavy Duty Curves and Spurs - Roll-A-Way Conveyors Inc.
CURVES: These heavier duty units either 45° or 90° can be used to move packages and boxes around corners or obstacles to complete a conveyor line. Guard rails can be added for extra protection. SPURS: Durable 45° and 90° roller spurs are used in limited access areas where exact entry is required to join several lines of conveyor. Specify right or left hand unit. Special angle spurs are also available.